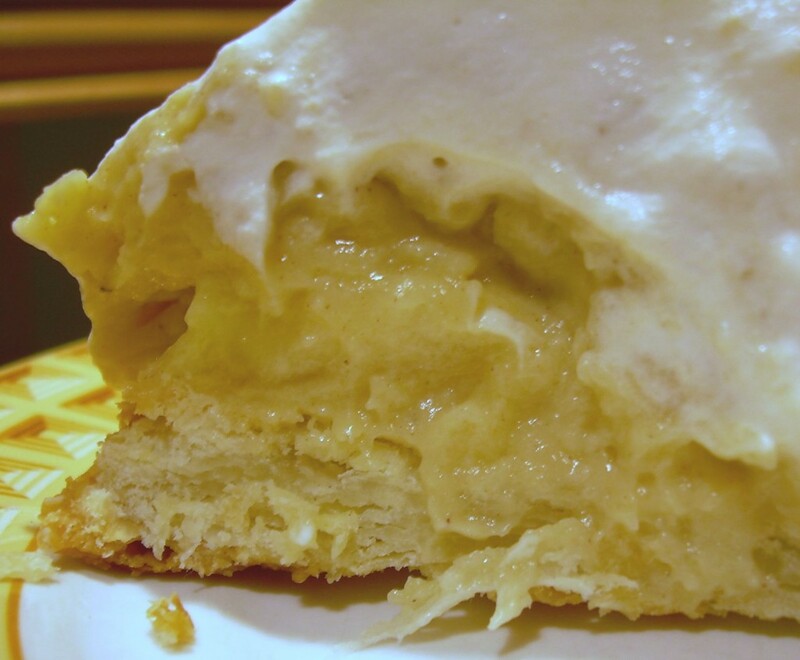 Mrs. Chow's Kitchen » Post Topic » TWD – Part 2 – Banana Cream Pie! TWD – Part 2 – Banana Cream Pie! Banana Cream Pie. BANANA CREAM PIE. Just the name sounds wonderful, and I have wanted to make this for more years than I can remember. This week, thanks to Amy of Sing for Your Supper, I finally made it! Check out her blog for the recipe. In the spirit of frugality and in the interest of cleaning out my freezer, I pulled out a blob of dough that represented the remains of several Dorie pie crusts. Folks, you just CANNOT throw out scraps when they contain so much butter. Now, re-rolling the crust so many times does make for a tough pastry, but it still tastes oh-so-good. I couldn’t find my mini-tart pans, so I ended up with something that wouldn’t quite fill a 9-inch pie plate. In the oven, it flattened out into a pancake. But I would not be thwarted! No! 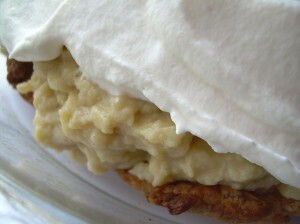 I piled everything on top of said pancake – bananas, pastry cream, bananas, and whipped cream. The verdict? Well . . . mixed. At first, I didn’t like the pastry cream very much. Why? I could taste the corn starch. Blech. I did like the depth of flavor that the nutmeg and brown sugar added to the dessert, but I really disliked the cinnamon. After I put the dessert together, everything tasted a lot better – the components work better in concert than individually. I would make this again, but I’d eliminate the cinnamon and use a whole vanilla bean while boiling the milk to intensify that flavor. Master Chow felt the same way, and we both agreed that our favorite elements were the bananas, crust, and whipped cream. To see what other bakers made, check out the TWD blogroll. Recipe after the jump. Put the flour, sugar and salt in a food processor fitted with a metal blade; pulse just to combine the ingredients. Drop in the butter and cream cheese and pulse only until the butter and shortening are cut into the flour. Don’t overdo the mixing. Add a little water and pulse once; add some more water and pulse again; and keep going that way. Then use a few long pulses to get the water into the flour. If after a dozen or so pulses, the dough doesn’t look evenly moistened or form soft curds, pulse in as much of the remaining water, or even a few drops more, to get a dough that will stick together when pinched. Once the dough is fitted into the pie plate, refrigerate it again. Keep the pie plate in the fridge while you preheat the oven. Way to go using up your leftovers! Your pie looks wonderful. I enjoyed this one but I can definitely see how you might not want as much cinnamon. I can just barely get by rolling a pie dough twice, any more than that and it’s done. I love cinnamon but somehow I don’t think it would come to my mind in banana cream pie. Leftover pie dough? I didn’t know such a thing existed! I’ve never had any dough leftover, usually I’m lucky if I can get it to fit the pan! I save my leftover pie scraps too. I have to say that I liked the flavor of this pie better the second day. The harsher elements of the custard mellowed, the flavor of the banana’s came through and the topping was very complimentary. Your pie looks really tasty, who cares if the crust is flat. Maybe cinnamon in the crust??? I did like the layering tho’. I agree with you, I think I would have liked it better as a more traditional banana cream pie, without the spices. Bummer about the cornstarch. That does not sound appetizing. I have a bunch of scraps and crumbs and who knows what else in my freezer. I really hate food waste. Good for you for using scraps. Your pie looks yummy.